Visiting or prospective Rotarians are welcome to join us for lunch at Subway's Gathering Place, 5 Lehigh Ave., Jim Thorpe at noon every Tuesday for good food, a program, and conversation. Call 570 325-4950 with a heads up. Welcome to the on-line edition of the Rotary Club of Jim Thorpe. Over the years, as a member and most recently as the Vice President of the Jim Thorpe Rotary Club, I have observed the incrediible dedication and leadership demonstrated by its members.It is my hope that in 2017-2018, we will continue our strong history of service by promoting this year's Rotary theme of "Serving Humanity", both locally and globally. The goals for the year will include these: growing our membership, continuing to support the Rotary Foundation, developing the newly formed Jim Thorpe Rotary Charitable Fund, increasing recognition of our club locally and at the district level and continuing to seek out new opportunities for service. Each year, we sponsor a number of projects and on-going programs as detailed in our Five Avenues of Service. Prominent among them are clothing at Christmas for disadvantaged children, dictionaries for every third grader in the Jim Thorpe Area School District, college scholarships to four graduating seniors from three area high schools, scholarships to rising juniors to attend the district's summer Rotary Youth Leadership Awards gathering, a summer day camp here in town, a short story contest, and a student of the month program in which local high school seniors attend weekly Rotary meetings to gain an appreciation of a community service organization. 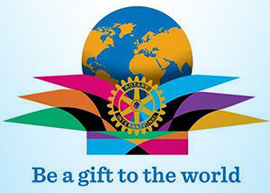 We continue to support The Rotary International Foundation's Every Rotarian, Every Year Program as well as contribute to the worldwide eradication of polio. For 2018-2019, we are extremely optimistic about the formation of the Jim Thorpe Rotary Club Charitable Fund. It is our hope that it will become a tool to expand and increase service to the children and families in our comunity. All this is made possible through our three fundraising activites: GhostWalks, Enchanted Evening, and a Bed and Breakfast raffle. See them listed on the left and be sure to try them all! We are always looking for new members who want to join us in our many activities. Drop in on a meeting and check us out.